The Bowling Green massacre is a fictitious incident mentioned by U.S. Counselor to the President Kellyanne Conway in interviews with Cosmopolitan and TMZ on January 29, 2017, and in an interview on the MSNBC news program Hardball with Chris Matthews on February 2, 2017. Conway cited it as justification for a travel and immigration ban from seven Muslim-majority countries enacted by United States President Donald Trump. However, no such massacre occurred. The day after the interview, Conway said she misspoke and had been referring to the 2011 arrest of two Iraqi refugees in Bowling Green, Kentucky, on charges including "attempting to provide material support to terrorists and to al-Qaeda in Iraq". She stated that she had mentioned the incident because it led President Barack Obama to tighten immigration procedures for Iraqi citizens. Her false statement went viral and became the top trending topic on Twitter, with many tweets parodying it. A website was set up anonymously for the purpose of collecting donations for supposed victims. Facebook users used the site's safety check feature to act as if the event were real. Mock vigils were held in Kentucky and New York in commemoration. It provoked widespread press reaction, with many relating it to Conway's earlier use of the phrase alternative facts to describe false statements by White House Press Secretary Sean Spicer in the wake of the inauguration of Donald Trump. In 2011, two Iraqi men who had entered the country as refugees were arrested in Bowling Green, Kentucky, on federal terrorism charges after they attempted to send both money and weapons to al-Qaeda in Iraq. Both were convicted of supporting attacks on the U.S. military while they were still in Iraq as well as attempting to provide material support to al-Qaeda in Iraq after they emigrated to the United States. Arrests were made on various charges, including "attempting to provide material support to terrorists and to al Qaeda in Iraq". Before entering the U.S., both had used improvised explosive devices in Iraq, although this was not known at the time of their admission. Both pleaded guilty; one is serving a life sentence while the other is serving 40 years in federal prison. The two did not attack anyone in the U.S., and there was no evidence that the men traveled back to Iraq or had any contact with the Islamic State of Iraq and the Levant after being admitted to the U.S. Neither was charged with plotting attacks inside the United States. In response to the arrests, the administration of Barack Obama re-vetted 58,000 refugees already in the country, imposed vetting on 25,000 other Iraqi citizens still in Iraq, and significantly tightened the processing of Iraqi visa and refugee applications for six months. Obama also instituted a requirement for new background checks on visa applicants from Iraq; as a result, Iraq travel visas were issued more slowly. The changes in visa verification were temporary, and some Iraqi refugees continued to be admitted to the United States throughout the period. In September 2014, on Fox News Sunday, U.S. Representative Peter King of New York referred to the 2011 arrest of Iraqi nationals in Kentucky as an attempt to "attack either Fort Campbell or Fort Knox". The fact-checking site PolitiFact.com, which evaluated the statement as being false, found that he had said something similar at least seven times previously. On January 29–30, 2017, White House Press Secretary Sean Spicer stated that Islamist terrorists perpetrated a terrorist attack in Atlanta, even though Atlanta has never had a terrorist attack carried out by Islamists. The initial comment was made on ABC's This Week, and then Spicer repeated the claim on MSNBC's Morning Joe the following day. Spicer later said that he meant Orlando, referring to the 2016 Orlando nightclub shooting, which was carried out by U.S.-born Omar Mateen. There have been two terrorist attacks in Atlanta: the 1996 Centennial Olympic Park bombing, which was carried by domestic terrorist Eric Rudolph, and the 1958 Hebrew Benevolent Congregation Temple bombing. A day later, on January 31, two days before the Hardball interview with Conway, Kentucky senator Rand Paul referenced the 2011 case in an interview with MSNBC by mentioning "the possibility or the attempted bombing in Bowling Green, Kentucky, where I live". The Washington Post's Fact Checker noted that Paul's statement was truer than Conway's because the Iraqi nationals did discuss bombing an Army target in the United States, even though neither was charged with making actual plans to do so. On January 29, 2017, in an interview with Cosmopolitan, Conway said that Obama had limited Iraqi immigration because "two Iraqi nationals came to this country, joined ISIS, traveled back to the Middle East to get trained and refine their terrorism skills, and come back here, and were the masterminds behind the Bowling Green massacre of taking innocent soldiers' lives away". On the same day, in a brief interview with TMZ, Conway stated: "He did that because, I assume, there were two Iraqis who came here, got radicalized, joined ISIS, and then were the masterminds behind the Bowling Green attack on our brave soldiers." I bet, there was very little coverage ‍—‌ I bet it's brand new information to people that President Obama had a six-month ban on the Iraqi refugee program after two Iraqis came here to this country, were radicalized ‍—‌ and they were the masterminds behind the Bowling Green massacre. I mean, most people don't know that because it didn't get covered. Although the interviews with Cosmopolitan and TMZ were conducted first, they did not become public until after the MSNBC interview aired. On February 3, the day after her MSNBC interview, Conway said she misspoke and that she meant to use the term "Bowling Green terrorists" instead of "Bowling Green massacre", referring to the two Iraqi men arrested in 2011. The Washington Post subsequently mentioned previous statements by Conway where she had made reference to the nonexistent massacre, indicating that "she doesn't appear to have misspoken at all". Conway's statement that the men became "radicalized" in the United States was found to be incorrect, as they had been radicalized outside of the country. Conway's statement that President Obama "had a six-month ban on the Iraqi refugee program" was misleading, as the Obama administration move was not a formal ban. Contrary to Conway's claims, there is no evidence that the men had traveled back to the Middle East or had any contact with ISIS after being admitted to the United States. Neither of the two was ever charged with plotting attacks inside the United States. Conway, in her February 3 statement, said that there was no coverage of the Bowling Green investigation, which she intended to refer to. However, there were approximately 90 news articles that covered the arrest and charges at the time. Conway's February 3 statement cited an example of that coverage, without acknowledging that her claim that "it didn't get covered" was also incorrect. On February 5, CNN declined an interview with Conway, partly because of "serious questions about her credibility" and partly because CNN could not get Mike Pence, whom the administration made available to all the other major Sunday shows. That day, she said in a text exchange, "Frankly they were terrorists in Bowling Green but their massacre took place in Iraq." Two days later, she was a guest on CNN, interviewed on air by Jake Tapper. In the interview, Conway apologized for repeatedly referencing a "Bowling Green massacre" that did not happen. In a March 2017 interview with New York, Conway said she intended to say "Bowling Green masterminds" rather than "Bowling Green massacre", in reference to "would-be terrorists who were apprehended before they staged an attack". The video clip of Conway's "massacre" statement went viral online, with the phrase becoming the top trending topic on Twitter. Some Twitter users wrote that, despite Conway's clarification, substituting "terrorists" for "massacre" in her statement did not make sense. Her statement was parodied on Twitter and other platforms with people creating fake tributes. A website was set up anonymously for the purpose of collecting donations for victims of the imaginary massacre; the donation link on the website goes to the ACLU's donation page. Facebook users mocked the Bowling Green massacre by using Facebook's safety check feature to pretend the event was real. 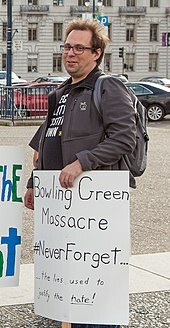 In New York City's Bowling Green, people held a mock vigil to commemorate the "victims" of the "massacre". Another mock vigil took place on February 3, 2017, in Bowling Green, Kentucky. Responses on the Donald Trump-centric subreddit /r/The Donald were "varied – and rather muted", with some redditors speculating that it was an intentional part of a larger strategy by the Trump administration. Samantha Schmidt wrote in The Washington Post: "Conway has taken 'alternative facts' to a new level". The Atlantic wrote that her "false statement stands out because it is simultaneously inaccurate and has the potential to be extremely inflammatory". Brian Stelter on CNN criticized the Trump administration for "hammering" the media for mistakes but going easy on Conway's error. British journalist Marina Hyde wrote a column in The Guardian criticizing the Trump administration for creating a fictional massacre when it was silent on the Quebec City mosque shooting. UK talk show The Last Leg's Alex Brooker commented: "Are there so few shootings in America that they're having to make them up?" Cosmopolitan reporter Kristen Mascia said: "It didn't surprise me that the comment was premeditated and that she'd tried it on multiple writers (who knows who else she auditioned it with, frankly). But others out there may not know this about her, and they should. We must call out the [White House] for stuff like this because it's egregious and totally unacceptable." After Chelsea Clinton posted a tweet that stated, in part: "Please don't make up attacks", Conway replied: "Bosnia lie a Great reminder", referring to how Clinton's mother Hillary Clinton falsely claimed to have landed in Bosnia "under sniper fire" during the Bosnian War. Writing in The New York Times, A. C. Thompson mentioned the 2012 case of a man who the authorities suspected of trafficking in counterfeit goods. His home and his store in Bowling Green, Ohio, were raided, and 18 firearms were found in his possession. Federal authorities believed that he was planning on killing African Americans and Jews. The man, who the prosecutors called a white supremacist, pleaded guilty to weapons and counterfeit charges, but prosecutors failed to establish that he was a political terrorist. The mayor of Bowling Green, Kentucky, issued a statement clarifying that "there was no massacre in Bowling Green", adding that he understood "how during a live interview one can misspeak and we appreciate the clarification". Conway's statement was parodied in two segments of season 42 of Saturday Night Live. In the cold open for that season's episode 13, Alec Baldwin, playing the role of Donald Trump, said that in the Bowling Green massacre, "[s]o many people died, but really they're the lucky ones. They don't have to see how bad The Apprentice has gotten". In episode 14's cold open, Melissa McCarthy, playing the role of Sean Spicer, recited a list of terrorist incidents that "you [the news media] never even write about", referencing a list of 78 supposedly under-reported terrorist incidents that the White House had released earlier that week. McCarthy, as Spicer, said: "The Bowling Green massacre—not the Kellyanne one, the real one. The Horror in Six Flags. The Slaughter at Fraggle Rock. The Night They Drove Old Dixie Down. Okay?!" ^ a b c "Federal Bureau of Investigation" (Press release). U.S. Department of Justice. May 31, 2011. Retrieved February 8, 2017. ^ a b c d Quoted from the following sources: "Conway referred to something that didn't happen—the 'Bowling Green massacre'." Resnick, Gideon (February 2, 2017). "Kellyanne Conway Refers to Fake Bowling Green Massacre". The Daily Beast. Retrieved February 2, 2017. Beauchamp, Zack (February 2, 2017). "Kellyanne Conway made up a fake terrorist attack to justify Trump's 'Muslim ban'". Vox. Retrieved February 2, 2017. Kessler, Glenn (February 3, 2017). "Kellyanne Conway's claim of a 'Bowling Green massacre'". The Washington Post. Retrieved February 3, 2017. ^ a b c d e Coscarelli, Joe (February 3, 2017). "Kellyanne Conway Admits 'Bowling Green massacre' Error". The New York Times. Retrieved February 3, 2017. ^ a b Office of Public Affairs (January 29, 2013). "Former Iraqi Terrorists Living in Kentucky Sentenced for Terrorist Activities" (Press release). Department of Justice. Retrieved February 3, 2017. ^ a b c Willingham, A. J. (February 3, 2017). "Here's what actually happened in Bowling Green". CNN. Retrieved February 3, 2017. ^ "Social media firestorm over Conway's Bowling Green massacre" comments". WBKO ABC 13. February 3, 2017. Retrieved February 3, 2017. ^ Benen, Steve (September 24, 2014). "The Fort Knox plot that only Peter King could see". MSNBC. Retrieved February 3, 2017. ^ Contorno, Steve. "Rep. Peter King says Islamic State tried to attack Fort Knox in 2011". PolitiFact.com. Retrieved February 3, 2017. ^ Murphy, Patricia (February 8, 2017). "Sean Spicer Makes Up Atlanta Islamist Terror Attack". Retrieved February 9, 2017. ^ Claiborne, Matthew (February 9, 2017). "Sean Spicer on Citing Atlanta Terror Attack That Never Happened: I 'Clearly Meant' Orlando". ABC News. Retrieved February 21, 2017. ^ Bluestein, Greg; Hallerman, Tamar; Galloway, Jim. "Your Daily Jolt: The Atlanta massacre never happened, either – Political Insider blog". Retrieved February 9, 2017. ^ a b Phipps, Claire (February 3, 2017). "Kellyanne Conway blames refugees for 'Bowling Green massacre' that never happened". The Guardian. ^ a b c d Mascia, Kristen (February 6, 2017). "That MSNBC Interview Was Not the First Time Kellyanne Conway Referred to the 'Bowling Green Massacre'". Cosmopolitan. Retrieved February 6, 2017. ^ a b Smith, David (February 6, 2017). "Kellyanne Conway's fictitious 'Bowling Green massacre' not a one-time slip of the tongue". The Guardian. ^ Resnick, Gideon (February 6, 2017). "Kellyanne Conway Referenced 'Bowling Green Attack' in TMZ Interview". The Daily Beast. Retrieved February 6, 2017. ^ a b c Chappell, Bill (February 3, 2017). "Bogus 'Bowling Green Massacre' Claim Snarls Trump Adviser Conway". NPR. Retrieved February 2, 2017. ^ Rahim, Zamira (February 3, 2017). "Twitter Mocks Kellyanne Conway's False 'Bowling Green Massacre' Comments". Time. Retrieved February 3, 2017. ^ Blake, Aaron (February 6, 2017). "Kellyanne Conway's 'Bowling Green massacre' wasn't a slip of the tongue. She has said it before". The Washington Post. Retrieved February 7, 2017. ^ Gajanan, Mahita (February 6, 2017). "Kellyanne Conway Has Claimed There's Been a 'Bowling Green Massacre' More than Once". Fortune. Retrieved February 22, 2017. ^ a b c d Schmidt, Samantha (February 3, 2017). "Kellyanne Conway cites 'Bowling Green massacre' that never happened to defend travel ban". The Washington Post. Retrieved February 3, 2017. ^ Rutenberg, Jim (February 5, 2017). "The Massacre That Wasn't, and a Turning Point for 'Fake News'". The New York Times. Retrieved February 6, 2017. ^ a b Quigley, Aidan (February 7, 2017). "Conway: CNN is not 'fake news'". Politico. Retrieved February 7, 2017. ^ Stedman, Alex (February 7, 2017). "Kellyanne Conway Apologizes for Bowling Green 'Massacre' Remark, Spars With CNN's Jake Tapper". Variety. Retrieved February 8, 2017. I regretted it tremendously because I used the wrong word to describe something several times", she went on. "I felt badly about that and I apologize and I rectify. ^ Nuzzi, Olivia (March 17, 2017). "Kellyanne Conway Is a Star Not your star, perhaps. But that's the point". New York. Retrieved March 24, 2017. ^ Sayers, Justin (February 3, 2017). "Kellyanne Conway on 'Bowling Green massacre': I meant 'terrorists'". The Courier-Journal. Louisville, Kentucky. Retrieved February 3, 2017. ^ "Trump aide mocked after 'Bowling Green massacre' lie". Al Jazeera. February 3, 2017. Retrieved February 3, 2017. ^ Ellefson, Lindsey (February 3, 2017). "Site To Get Donations for 'Bowling Green Massacre Victims Fund' Launches". Mediaite. Retrieved February 3, 2017. ^ Disbrow, Bill (February 3, 2017). "'Bowling Green Massacre Victims Fund' website links to ACLU donation page". San Francisco Chronicle. Retrieved February 3, 2017. ^ Seppala, Timothy J. (February 3, 2017). "Facebook users pretend the 'Bowling Green Massacre' is real". Engadget. Retrieved February 4, 2017. ^ "New Yorkers hold vigil at Bowling Green for 'massacre' victims". New York Daily News. Retrieved February 4, 2017. ^ Schreiner, Bruce (February 3, 2017). "Never remember: Bowling Green laughs along at massacre that wasn't". The Courier-Journal. Louisville, Kentucky. Retrieved February 4, 2017. ^ Bump, Philip (February 3, 2017). "Analysis: What came after Conway's 'Bowling Green massacre' statement". San Francisco Chronicle. Retrieved February 3, 2017. ^ Foran, Clare (February 3, 2017). "Kellyanne Conway and the Bowling Green Massacre That Wasn't". The Atlantic. Retrieved February 3, 2017. ^ Stelter, Brian (February 3, 2017). "Will Trump give Conway leniency he won't give media?". CNN. Retrieved February 3, 2017. ^ Hyde, Marina (February 3, 2017). "Bowling Green massacre? Kellyanne Conway has taken alt facts up a notch". The Guardian. Retrieved February 3, 2017. ^ "The Last Leg". Series 10. February 3, 2017. ^ Stelter, Brian (February 6, 2017). "Kellyanne Conway's "Bowling Green Massacre" wasn't one-time slip-up, Cosmo reveals". CNNMoney. Retrieved February 7, 2017. ^ Clinton, Chelsea [@ChelseaClinton] (February 3, 2017). "Very grateful no one seriously hurt in the Louvre attack ... or the (completely fake) Bowling Green Massacre. Please don't make up attacks" (Tweet) – via Twitter. ^ "Kellyanne Conway under fire after citing non-existent 'Bowling Green massacre' to defend refugee ban". Boston Herald. February 3, 2017. Retrieved February 3, 2017. ^ Merica, Dan (February 3, 2017). "Chelsea Clinton knocks Kellyanne Conway: 'Please don't make up attacks'". CNN. ^ Thompson, A. C. (February 8, 2017). "When the Government Really Did Fear a Bowling Green Massacre". The New York Times. ^ Izadi, Elahe (February 5, 2017). "Alec Baldwin returns as Trump on SNL, where an evil Bannon is actually president". The Washington Post. ISSN 0190-8286. Retrieved February 13, 2017. ^ a b Izadi, Elahe (February 12, 2017). "Melissa McCarthy returns to SNL as an even more frustrated Sean Spicer". The Washington Post. ISSN 0190-8286. Retrieved February 13, 2017. ^ a b Doubek, James; Peters, Maquita. "Melissa McCarthy's 'Spicey' And Alec Baldwin's Trump Return To 'SNL'". NPR.org. NPR. Retrieved February 13, 2017. ^ Hjelmgaard, Kim. "Media covered most of 78 terror attacks Trump said 'not even being reported'". USA TODAY. Retrieved February 13, 2017.